Plan_GoodCents – ThermoBuilt Systems Inc.
Good Cents - 1009 Sq.Ft. 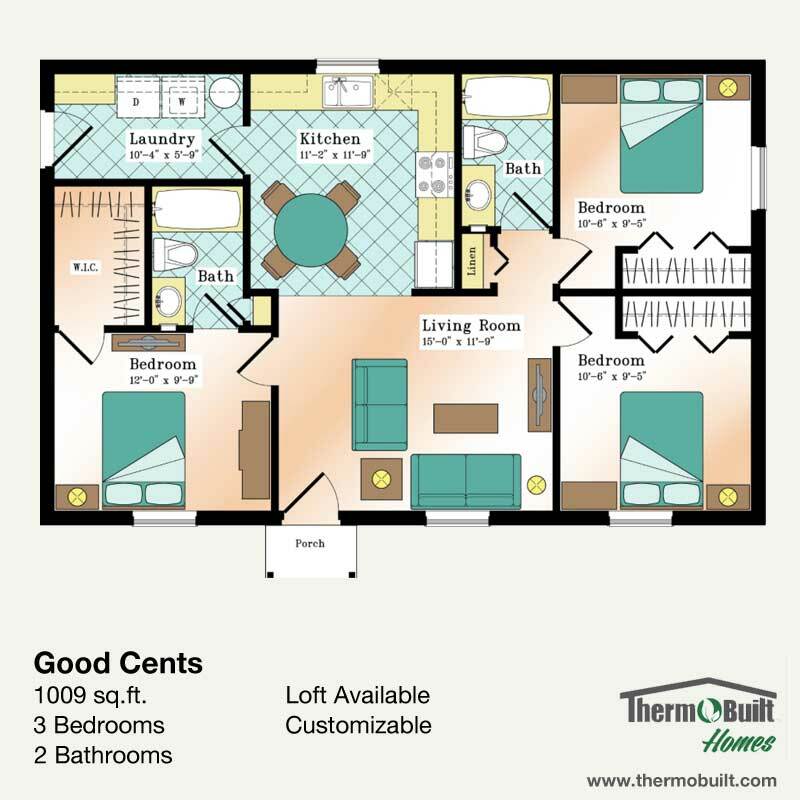 The Good Cents plan is a 1,009 square feet, three bedroom and two full bath plan well suited for a variety of needs. This plan is designed to accommodate the addition of a Loft. An eat-in kitchen anchors the common area, and is right off of your Entry and Family Room. A laundry room off of the Kitchen area is large and can accommodate plenty of incoming traffic. The large Great Room and open Dining Room anchor your main living areas. A Master Bedroom features a walk-in closet and an En-Suite with Linen Closet. Two additional equally sized bedrooms, and a Full Guest Bath complete this plan. LINK: The Loft version offers an additional 518 square feet of living space, and additional storage options. Wall Height Option: 9' and 10' available. Ask for details. Available Loft: See out Good Cents with Loft Plan.